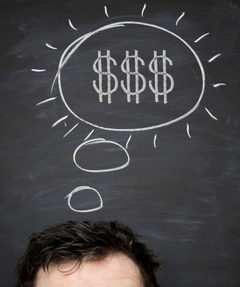 Does being reminded of money make you an uncooperative jerk or an independent thinker? Dedicated readers know that I’ve written a fair bit on how contingent rewards, including money, can go awry in all sorts of ways — resulting in poorer performance, diminished creativity, reduced interest in tasks that were once intrinsically interesting, and so on. But can the very idea of money also affect our behavior? Next, they took the participants and another person of the same gender into a room and gave them a beverage to taste. This is a new sports drink called Vigor, they told their subjects, and we want your opinion of it for a marketing study. A minute later, the other person — who was actually the experimenters’ confederate — got up to leave the room, mentioning that he or she had already tasted the drink. Some of the confederates added, “This drink tastes really good. I just love it.” Some said, “This drink tastes really bad. I just hate it.” Some said nothing. Then came the test: Did the money prime make any difference in the participants’ opinions about the beverage? Ample research, especially the extraordinary work of Robert Cialdini, has shown we’re quite susceptible to social influence. When we hear that other folks like something, we tend to like it, too. And that pattern held — at least for the people who saw shells in their computer background. These folks liked the beverage more when the confederate said he or she liked it and less when the confederate said he or she didn’t like it. Liu, Smeesters, and Vohs say that money cues can operate as threats and “produce contrarian reactions that are the opposite of the source’s intent.” Other research has shown that being reminded of money can make people more single-minded and more apt to work harder — but also less social, less cooperative, and less likely to help others. So the next time you try to raise the issue of moolah in an effort to persuade a prospect or an employee, think twice. Making it all about the coin can sometimes get you the opposite of what you want. Insightful study! Are there more similar ones available? This is interesting and I have just sent this article to some people I work with in Direct Marketing. They are always raving about how much money you can make, which I can see makes some people very uncomfortable, and I see it, but when I talk to my associates about what I noticed I get a reply “If they say they aren’t interested in the money then they are liars!” and though I can accept that most (if not all) people are interested in money, perhaps with some people a different approach is needed. Really interesting, but I wonder which group was closer to speaking the truth. The shell group was too malleable; they adjusted their opinion to match the confederate’s. The Euro group was too contrarian; they adjusted their opinion to oppose the confederate’s. Neither situation sounds good to me. How do you get the people to just be honest? 1. Is anyone being paid for their opinions (e.g., the confederate could have been regarded as a possible shill). 2. If anyone is being paid, why not me? Those sorts of suspicions or resentments could well create a contrarian response! So maybe a way to influence people with money is on the lines of saying “The product is really good but maybe you would rather no buy it now. Better to save the money. Money is important”. Then stand back and watch them argue with you! @AIM – I’m one of those people who is always turned off by Direct Marketers emphasing money. DM without a great product is a glorified pyramid scheme (at least to me). In light of this, do you think that we should eliminate money talks during the annual review of employees? Or at least make 2 appointments, one to talk about the actual activity – never mentioning pay, and the other to specifically talk about pay raise? Interestingly, as we prepare for a visit of delegates from our sister school in China, we’ve been told that it’s not uncommon for them to ask many personal questions about money. For example…how much do you make/how much do you pay on your mortgage. Culturally, that would make anyone in America squirm. I wonder what the effects of this experiment would have on other cultures around the world. Are the emotional effects of money universal? So, a good portion of my promotional marketing business is sort of based on incentives… But, also on genuine gestures of appreciation and rewards for work done – vs. a carrot or a stick type scenario. And of course a ton on building good will, brand awareness, etc. However, I was wondering if the study could be extrapolated differently… if the idea of money itself could create an adverse reaction, does that apply only to money, as opposed to other non-monetary incentives? Often clients developing incentive campaigns come back to “people really just want more money” and then opt for gift cards or cash incentives. However, I would *love* some sort of study that showed that while cash can create a negative psychological reaction, other incentives might not do that. For instance, we’ve used health and wellness incentives in our own office – where a person hitting a particular goal is given either office-friendly health equipment (balance ball chairs, for example) or a gift of 10 fitness classes (yoga is a popular favorite). In my own opinion, branding should be experiential, as much as possible, which I don’t find cash to be. But, if your thought is that all forms of incentivization (clearly not a real word) have a net negative impact, I would like to hear that reasoning so that I can consider including that viewpoint as I evaluate how I can best serve my clients. My experience is that, even if the “carrot” is not tangible (like a title), people behave differently when there’s a price involved. I have a personal experience where someone feel threatened because I caught an error he made and blamed me falsely with the boss just to keep his status as “the leader”, even when I corrected the error without pointing fingers (without telling anyone but him), and to be honest, I didn’t even think badly of him for the mistake (after all, we all do). So, when there’s a price involved, economical or otherwise, we become egocentric and insecure. Very few survive at their lure.